Amos Jansen is merely a clerk. He is not a crime fighter, the next great writer, or a man of privilege. He is the humble employee of a Chicago literary society. That is, until he is arrested for murder. The scapegoat of a perfidious lieutenant, Jansen stands wrongly accused while his idols rally around him. 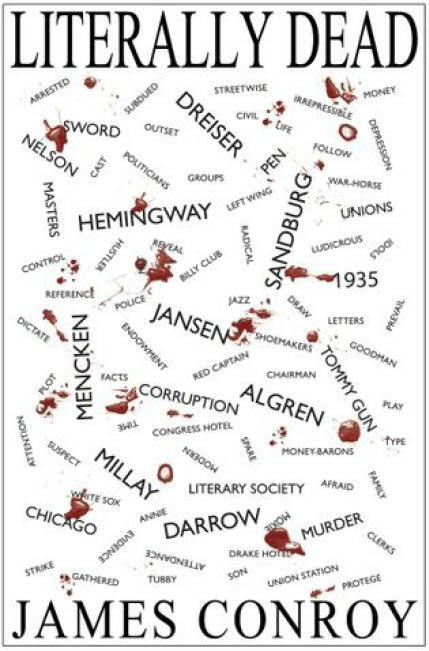 Literary personalities the likes of Ernest Hemingway, Carl Sandburg, Edna St. Vincent Millay, Nelson Algren, and H. L. Mencken, as well as civil liberties warhorse Clarence Darrow, join Amos in his search for the real murderer of both the society's vice-chairman and his own father. Will the pen prove mightier than the pistol? Will mercenary police, politicians and money-barons meet with justice? Or will Jansen fail to solve the mystery and wind up literally dead? Literally Dead is an engrossing satirical murder mystery set in 1930’s Chicago during the Great Depression - those grand old days of gangsters, corrupt policing, and Prohibition. At the heart of the story is a poor writer named Amos Jansen who gets wrongly arrested for a murder he doesn’t commit. Supporting him, eager to prove his innocence, are a bevy of real literary figures of the time, among them Ernest Hemingway, Clarence Darrow, and Edna St. Vincent Millay along with a few others. I loved the way the author made Ernest Hemingway come to life – crusty, wily, charismatic, and witty, I could not get enough! It made the story highly entertaining. Along with a fascinating mystery to unravel, there were pleasant laughs along the way. Don't judge this book by its unappealing cover. I would never have picked it up off a book stand. But don't be fooled. This is a very good book. If you are looking for something different in historical fiction, this rich, enchanting story is sure to entertain you from start to finish. I really enjoyed it and highly recommend it. Exceedingly charming!